Take advantage of our discounts and special offers in Normandy! Nature, ecological holidays, sports, farm stays, gites by the sea ... Discover our theme offerings and enjoy new experiences by sharing the passions of our owners! Seine-Maritime, land of lights and contrasts dear to Impressionist painters blends unique landscapes: the high cliffs of the Alabaster Coast, the green islands designed by traditional enclosed farmyard and inland bocage. Follow the road on the banks of the Seine meanders which ferries and bridges link the two sides to end up at Rouen, the 'Hundred Spires City'. Discover the new Gites de France holiday rentals: gites with swimming pool, bed and breakfast by the sea, City Break in Rouen, unusual accommodations such as floating huts, water bubble or refuge ... Find the place Ideal for your next stay in Normandy! 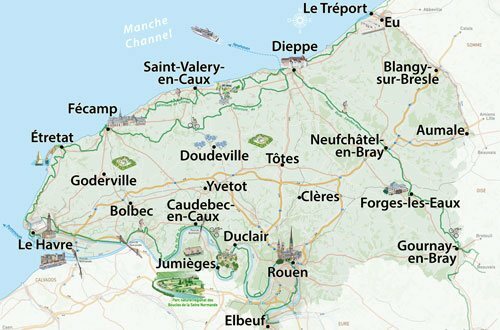 Gîtes de France Seine-Maritime advise you to rental houses and cottages in Seine-Maritime and throughout Normandy for a weekend or holiday. We offer different types of accommodation: self-catering cottages, gites near the seaside, gites for groups, bed and breakfast and guest houses, holiday homes, campsites or cottages. We also offer the opportunity to book your accommodation on our site. Gîtes de France Seine-Maritime: your tourism partner Norman earth! Vertiginous cliffs, typical ports, green valleys but also abbeys, glass and lofts ... The Gites de France Seine-Maritime invite you, in the heart of Normandy, to discover an extraordinary heritage a few steps of the Paris Basin. We offer different types of accommodation. Farmhouses, cottages or lodges in the city sea, guest houses, lodges groups, children and campsites, trailers: Choose the place for you! Gîtes de France Seine-Maritime fill all your needs, whether you dream of comfort, charm and friendliness, time for a weekend, a longer stay or holiday.